So You Want to Design Clothing? Nothing is more exciting than designing clothing. Creating clothing designs is fun work for the most part. Personally, I like putting on a song and just going for it. Many people aspire to clothing design artist. Clothing design is a multi-billion dollar per year industry. So how do you begin to design your own clothing. First you assess your design skills. Can you draw or do you just have images in your head that you struggle to get on paper. Do you hand draw really well but you need to make Digital Sketches for your manufacturer? There is help for people who can draw and for those that can’t draw at all. The answer is Digital Fashion Pro Fashion Design Software. 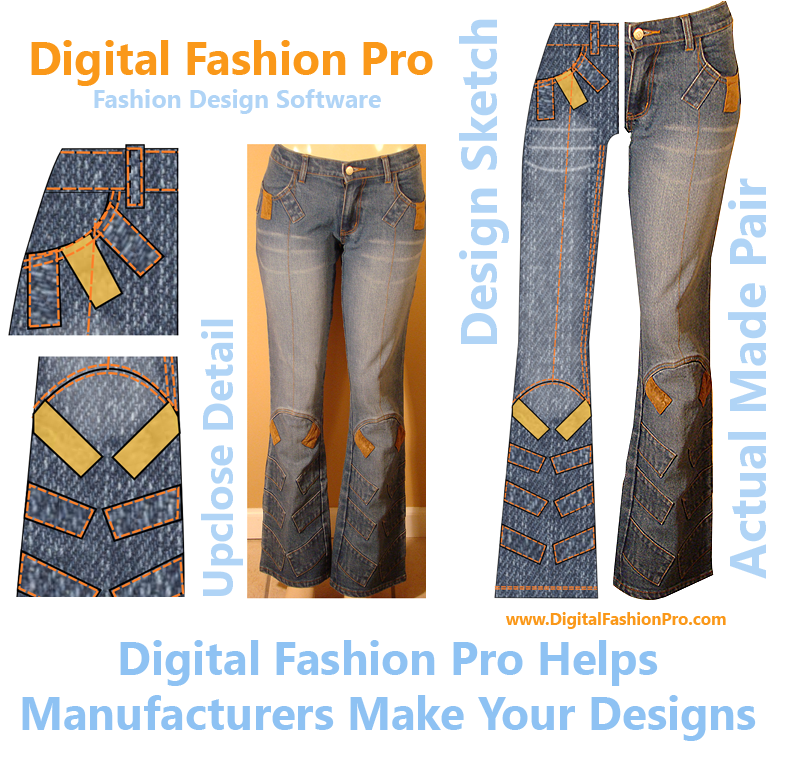 Designing clothing with Digital Fashion Pro is a breeze. The clothing design program will help you illustrate your clothing design ideas with professional results. Creating clothing sketches can sometimes be done in minutes when you know exactly what you want to design. Here are a few examples of the kind of clothing designs that can be created with Digital Fashion Pro Family of Fashion Design Products: See our gallery of clothing designed with Digital Fashion Pro. You can design any type of clothing you want with Digital Fashion Pro. Menswear, ladies and children’s clothing. You can even design shoes with this clothing design software. Create clothing on fashion model templates as well with DFP. So here’s how you design clothing with Digital Fashion Pro – Clothing Design Software. First you grab a clothing template or fashion model template that is close to what you want to design. Then you add your designs to it – seams etc. Then you next add the clothing fabrics from the fabric library of the system. Adding the digital fabric to your clothing designs will help give your design that realistic effect that you see above. After that you can add more design elements to your clothing plus logo’s etc. It is that simple with Digital Fashion Pro clothing design software. You don’t have to know how to draw at all to put together cool clothing designs. If you can draw already – great! No matter what your clothing design background is – it all comes down to your creativity. For information on how to start your own clothing line Click Here. Designing Clothing – The Chance to Touch the World! If you have a creative mind, then you may discover that you also have the ability and interest needed to design clothes. Those who design fashions are able to use their natural talents and interests to create something entirely new to share with the world. The opportunity to design clothes is also an opportunity to share your point of view and your unique perspective. Many people think that they can’t use their natural enthusiasm to design clothes simply because they don’t have a lot of artistic skill when it comes to drawing. After all, everyone knows that the first step when you want to design fashions is to create a sketch of the design, right? In many ways that’s true, but there are products like Digital Fashion Pro that allow the would-be fashion designer to create realistic “sketches” of their ideas without ever picking up a pencil and paper. Instead, the software helps you translate your design idea from a thought into an actual picture on the computer screen. Use the included tools to try different fabrics, to add graphics, and to include accessories to your design concepts. Of course, there are other ways to design fashions that set trends and share your artistic vision. If you choose to use software to help you design clothes, make sure that the product also allows you to create accessories. After all, what woman’s outfit is complete without a handbag, belt, and a great pair of shoes? Whether you want to start simple and design T-shirts, or you plan to start your own clothing line complete with fashion accessories, products like Digital Fashion Pro can be instrumental in taking you to that professional level. 1. The very first thing you need is creativity. Do you have great ideas for fashion designs? Creativity is the number one trait needed to be a fashion designer along with a close eye for detail. 2. Is there a void in the market for what you want to design? Many people realize their fashion calling because they can’t seem to find anything they like when they go out shopping. They feel that by bringing their vision to the world – it would benefit others and themselves. 3. Passion and commitment. Is becoming a fashion designer just a fly by night thing for you or do you seriously want to take over the world of fashion against all odds and challenges to gain creative and financial reward. There is nothing like seeing other people wearing and loving your designs. 4. Fashion School. Do you have the funds to go to fashion school and get a well rounded education on fashion. Fashion schools provide a lot of useful information on becoming a fashion designer. They offer courses in pattern making, drafting, CAD illustration, drawing, fabrics etc. Fashion schools are quite expensive. My only gripe about fashion schools is that most of them just teach you how to work for someone else at the end of day. Very few go out on their way at this time to teach you how to start your own fashion line. There are a few fashion schools that have come up to speed with today’s times like The Art Institute of San Diego that also teaches our 1 Book How to Start Your Own Clothing Line Course in addition to their regular fashion curriculum. In close, fashion schools are great for those that can afford it and want a well rounded education. Now, what if you don’t want to go to fashion school or you simply can’t afford it? There is still much hope for you! Which brings us to number 5. Can you become a fashion designer without a college program? Absolutely! Some of the most famous designers either went to fashion schools for short periods of time or failed to go at all. 5. Illustration is king! In fashion design – the main objective is to convey your creativity as best as you can to others. When others see your fashion designs – they should be moved – they should know exactly what your vision is without having to use their imagination too much. I might be a little biased but in reality I think hand sketching in today’s times is a little overrated. Let me tell you why. I have worked with many clothing manufacturers from all over the world. I remember when I first started I would send them these hand sketches with a bunch of notes and instructions wrote on them. After a while, they E-mailed me to tell me that they would prefer that our company sent computer drafted sketches vs. hand sketches. This is how Digital Fashion Pro was born. Of course we heard from other big companies (that I’m not going to name right now) that designers who work for them needed to know how to use Adobe Illustrator. We decided to do a little something different for a number of reasons. We created a system that would go three steps further. We decided to create our Digital Fashion Pro System that would adequately convey our fashion designs to our manufactures in a way that was superior to the sketches they were getting from others. We also created catalogs with our the Digital Fashion Pro system and took them to the Magic Trade show (Clothing Industry Trade show) where we were exhibiting. Buyers took to our realistic fashion sketches because Digital Fashion Pro makes the best fashion sketches hands down. With creativity and The Digital Fashion Pro System – your fashion illustrations will be incredible. So I said all of that to say this. As long as you can create professional computer illustrations of your concepts – you are well on your way to becoming a fashion designer. With the Digital Fashion Pro system that not only gives you the software to create but also the learning tools to know how to create can help you become a fashion designer. There’s no need to put your dreams off just because you can’t afford fashion school or don’t have the time to go. Another great thing about the Digital Fashion Pro system is that it is based in art – not just click and snap. You get a real art course that shows you how to design like real designers do. The best part is that you can have limited drawing skills to no drawing skills and still make beautiful cutting edge designs. Now if you can draw already – then Digital Fashion Pro will even help you expound on your creativity and take it to new heights. We are quickly becoming the industry alternative to Adobe Illustrator which is just a general purpose software where our Digital Fashion Pro is not just a software but a complete system dedicated to art of fashion. With new clients such as Ed Hardy coming aboard everyday – Digital Fashion Pro is the right choice to start making your fashion designs with. a. A good Spec and Measurement Book such as the one found in our superstore that will teach you how to measure and grade your garments. Having good specs and great illustrations are by far the 2 most important pieces of the puzzle to getting your clothing made. You need a spec chart for each article of clothing you want made period. Sending a garment from another clothing line or designer for a manufacturer to try to make yours from isn’t going to get you far. You need good measurements period. After having good measurements – your illustration at this point gives the manufacturer the visual reference they need to do a good job. Many new designers under estimate this point. Further note that while patterns are good to have and send to a manufacturer – they aren’t mandatory. The single most important thing again is having your technical sketch and a spec chart! In fact, once again many new designers go through a lot of money, time and energy trying to ship patterns to manufactures because that is what they were taught. Only to find out that even with the patterns – manufacturers still get the garment wrong. At this point, you will be out of pattern making cost, shipping cost and the time it took you to ship your pattern to the manufacturer in the first place. The most economical way to send your styles to manufactures is via E-mail. Send them your tech pack and they’ll be off and running. b. The know how to create your own garment technical specification charts – we actually teach how to illustrate garment technical sketches and set up spec charts on our Digital Fabric Library Upgrade CD for Digital Fashion. We also have The Fashion Business Center which comes with clothing spec sheet templates and more. 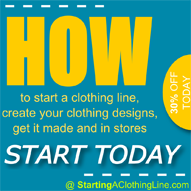 c. The knowledge about how to get your clothing made and work with manufactures – see the starting a clothing line 1 book course. It is important to get smart fast about the fashion industry. 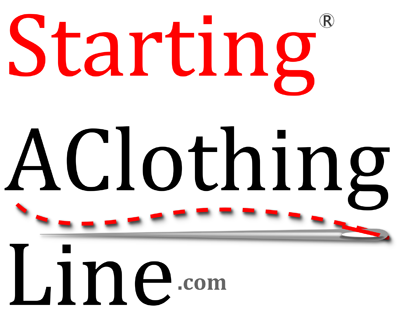 The startingaclothingline.com – 1 Book Course from StartingAClothingLine.com is the best there is in terms of learning the ins and outs about being a fashion designer and starting your own clothing line. The information presented in the Official Step by Step Guide to Starting a Clothing Line is a must for all new fashion designers according to Julie Patterson – Department Chair – at the International Academy of Design and Technology. We agree! Also the course covers getting your Trademark and more. d. The desire to seek and find any helpful information that can help you learn more and more about fashion design and the business side. e. For those of you who can sew (which is a definitely a good skill to have but not a requirement) could also invest in Pattern Making Software. This will allow you to print your own patterns. For those of you who can’t sew don’t fret. You just focus on creating the design and surround yourself with others who can sew. People like seamstresses, tailors, professional pattern makers and garment manufacturers will do your sewing. Just make sure you pay attention to detail and learn along the way. The funny thing about fashion is sometimes a person can sew very well but lack artistic vision. On the other hand, some people can’t sew but can design super well because they ooze with creativity. Remember Creativity is #1! f. Another item that all fashion designers and companies have in their arsenal is a good old fashion / textile Pantone Color Book. This book is the international standard of color. When you want to communicate to others the color you desire – you give them the color’s pantone number and they will be able to reference the same color on their end. There it is. These are the things needed to become a fashion designer. Once you get an understanding of fabrics and you can illustrate your designs – you can become a illustrations, head designer, or even start your own fashion line. Remember – the first thing you need is creativity so you can create some killer collections. Then you need a great computer graphics program or system like Digital Fashion Pro to help you convey your fashion message in the best way possible. Now just how good of a fashion designer you become will depend on your own creativity and ingenuity. So if you want to become a fashion designer – don’t put it off no longer. There is no time like today to get started. You don’t have to get everything I mentioned here at once but by all means – put your fashion dream into action today! You owe it to yourself to at least give it a try. So where should you start? I would say get one of the Digital Fashion Pro packages and start creating some designs first to get a feel for designing. Start getting your feet wet then move on from there. Showing others your designs could spark others like investors to get behind you. Your designs can also be used to start building clientele and general interest in your clothing designs. You could even start doing freelance designs. Designing is definitely a great place to start because that is the foundation of your fashion career. The buzz you’ll start creating will also serve to build your confidence as a designer and give you the passion you need to go forward. You can find Digital Fashion Pro and so many other helpful resources at StartMyLine.com. Getting advice from those who have already been successful is a great way to gather the information that you need in order to get your own clothing line started, and the site offers some amazing products and suggestions that help you do just that. Are you great at coming up with clever ideas that you can use to design T-shirts? If so, use the site to find resources for getting them produced. Do you have the best ideas for the next look in evening wear? The site will help you learn how to get them manufactured as well as how to get them sold. There are so many reasons that the fashion industry is one of the most exciting places to work. In addition to sharing your creative ideas with the world, you also have the opportunity to work with some of the most interesting people out there. The chance to design clothes is unlike any other career. With clothing design, one has a chance to touch the world and that probably is the best benefit of all. Learn more about the latest fashion, style and clothing line news here on SCL.